On a primitive planet inhabited by warlike humanoids with a robust theater tradition, Torres is bitten by the acting bug, and there's no hypospray for that. - During its development, this episode was heavily revised. Kelis actor Joseph Will stated, "I recall that rewrites were happening up until the moment we were to shoot the scenes, which I had never experienced before." - The start of production on this episode was difficult for Joseph Will. "I remember being incredibly nervous the first day of shooting, which was the scene in the Delta Flyer when B'Elanna and Kelis meet," he recalled. However, Will found that Roxann Dawson helped him through his work on this outing. Will reflected, "Roxann was so supportive and professional that it set my mind at ease as we worked several consecutive 14–16 hour days." - This episode was nominated for an Emmy Award for Outstanding Costumes for a Series. - Robert Blackman was extremely happy not only with the costumes designed for this episode but also this outing itself, referring to the installment as "a wonderful episode [...] which has a lot of really amazing-looking stuff." "Logical Tuvok does not cry. That's why they call him logical!" "They'll understand that beneath their unfeeling exterior is a heart that's breaking silently and in more pain then any of us could possibly understand. Because that's what it is to be Vulcan." "Harry Kim saves the day. Just the ending I was looking for!" This is one of only two VOY episodes we've gotten to of which I had absolutely no memory on this rewatch. ("Concerning Flight" was the other.) Due to that, and the not-at-all promising opening scenes (which make the note above about reshoots not terribly surprising), and the prominence of masks (which didn't turn out so well last time), AND the similarity of this episode's title to that of one of DS9's worst episodes, AND the seemingly corny premise, well, let's just say I wasn't optimistic. It ended up a lot less painful than I expected. It helps that the guest dude's character was well-written and performed; he's no Lyndsey Ballard, but he's an effective one-shot character, and his situation feels plausible. What also helps is that it's a B'Elanna episode—they never seem to be a total waste of time, do they?—and that everything B'Elanna does here feels pretty in-character, yet at the same time feels a little like character growth, which is saying something this late in the show. It's the kind of thing Beltran was probably chomping at the bit for. That said, none of it is especially…well, memorable…and a level of corniness does remain, but that's true of so much of this franchise that it's probably not even worth discussing. Meta-continuity-wise, it's neither the first nor last time that the show plays around with Skewed In-Universe Depictions of Our Main Characters Where They Behave Incongruously (see also "Worst Case Scenario," "Living Witness," and season seven's "Author, Author"). And speaking of meta, it's pretty great that a story about rewrites happening right up to the last minute required rewrites happening right up to the last minute. What's slightly more awkward is the strong possibility that the scene where the actors are pissed at Kelis's latest script was very likely drawn from behind the VOY scenes. It's too bad that John Schuck was criminally underused in this, his only VOY appearance. ENT fans may recognize Crewman Cutler, Kellie Waymire, as the jealous girlfriend. Speaking of ENT, Joseph Will came this close to landing the part of Trip Tucker. Obviously, Kelis's sequels would never live up to the amazing special effects he managed to pull off in the "Ascend to the Heavens" scene, infuriating and radicalizing thousands of Kelis enthusiasts and plunging his world into unprecedented bloodshed. And THAT's why you don't violate the Prime Directive. Particle of the Week: No clear winner. Pointless STO Comparison of the Week: Star Trek Online doesn't feature many missions where the player is denied access to their equipment or forced to interact with less technologically advanced civilizations. * Maximum Possible Photon Torpedoes: -8. * Credulity Straining Alpha Quadrant Contacts: 14. * Janeway's Big Red Button: 2 aborted self-destructs, 1 successful, 2 games of chicken, 1 ramming speed. * This is a workmanlike episode. It ended up a lot less painful than I expected. Yeah, this. I did sort of remember the episode, and remembered disliking it at the time (more about that below). This time... eh. It was fine, and mostly for the reasons you cited: the playwright is okay, and I was happy to get a B'Ellana episode again. This episode also follows a generally winning Voyager formula: it's basically an updated TOS plot, and they handled those better than most stories. I will say that Voyager as an old timey play was pretty funny. If I were into fan projects, I'd be tempted to redo more of the series in this format. * The way this story approaches inspiration is deeply offputting to me. I've been telling stories most of my life. I know what it's like to be in the zone, to get on a roll and have a story just flow, and it's magnificent. The only thing I can compare it to is falling in love, because the process is almost the same for me: absorption in details bordering on obsession, forgetting to eat or sleep and so on. Being sad when it's over. It's amazing when it's there, and I always want it back. Most of the time, though? Writing is just about discipline. The human brain is a hypothetical-generating machine. We conceive of imaginary scenarios virtually nonstop, (hell, we even do it when we're asleep), and the big difference between a writer and a non-writer is in which person bothers to write any of it down and maybe apply a spellcheck, arrange an editor and so on. It's all in who turns it from idly fancy to work, same as a lot of other things in life. The first time I saw this story, I was deeply irritated because that element of discipline is missing here: the story offers us an author who is a helpless and passive party waiting for ideas to fall into his lap, and it just... sounds flaky to me. On a meta level, that idea of the creator as a victim of muses beyond their control contributed to my impression that the Voyager writers aren't good at what they do. I was feeling more charitable this time. I mean, we joke, but stranger things have happened in canon. I always saw this episode as the series reacting to Star Trek fan fiction and having fun with the idea. While I've never written Trek fan fiction, it's one of my favorite episodes for that reason. I once wrote a Frasier script as part of a screenwriting class so I guess that's close. I really enjoyed this episode the first time around, and seeing it with fresh eyes was wonderful. I love John Schuck and Tony Amendola. They're fantastic character actors. And how cool was it to see the late Kellie Waymire in another Trek role! I didn't realize that she was in this episode until this rewatch. 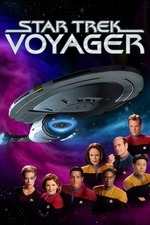 This was writer/producerJoe Menosky's final season with Voyager. Muse wasn't the last script / teleplay he wrote (which was the season 6 finale and season 7 premiere: Unimatrix Zero parts one and two,) but as you note, it was a story that felt very meta. As if the dialogue and commentary were an extended critique and explanation of Voyager's writing process and storytelling. Kelis: "The Rescue of B'Elanna Torres. We begin with Harry Kim reaching Voyager in the escape pod. He tells Captain Janeway that B'Elanna Torres is lost. We continue to the point where they discover a piece of the Delta Flyer. After that..."
Torres: "It's simple. They search for B'Elanna Torres. B'Elanna Torres is found." Torres: "Or not found. The end. It sounds pretty straightforward to me." Kelis: "That's exactly the problem. Where is the mistaken identity, the discovery, the sudden reversal? Mistaken identity, a character who is someone else. Discovery, the moment when that identity is revealed. Reversal, a situation that turns from good to bad in a blink of an eye." Chorus 1: "Find the truth of your story and you won't need all those tricks. I don't know how things are done across the Eastern Sea, but here poets have become lazy. They rely on manipulation to move their audience. It wasn't always that way. Welcome." Kelis: "The truth of my story. It's an old-fashioned idea. Today, audiences want excitement, passion. Let me show you what I've done with Captain Janeway and Commander Chakotay. Let's make a good impression on our visitor." All television and theater is formulaic. From its structure to the way that the stories are told. This episode is no different. But it's quieter and less intense than most Voyager episodes which is such a fresh change of pace. We see strangers portraying our heroes for the second time in two episodes. "Today, audiences want excitement, passion." The highlighted lines above are an expression of regret (lament?) by the writer, that the stories audiences want to see are more action-oriented, filled with formulaic tricks and gimmicks, which in his opinion detracts from the story. It's hard not to imagine, watching that scene, what show the Voyager writers might have come up with if they could have done the show on say, Netflix or HBO, with a freer hand from network interference and less of a restrictive leash. Where they weren't tied to an intense 25 episode season schedule and constant last-minute rewrites, forcing them to repeat plot points. Speaking of which, the Delta Flyer crashes in this episode. CONTRIVANCES OF THE WEEK: The Delta Flyer crashes, and yet everything on the ship needed to advance this story, like the library computer and the transporter, still works. And again, like in last week's "Live Fast and Prosper," we see stupidity with regard to the Delta Flyer's computer, like a total lack of security (i.e. Kellas was able to get in even though the most sophisticated machine he'd ever seen is probably an abacus). This is an episode in which the metacommentary is especially heavy, even with there being a lot of metatext in recent episodes. (I may have said this before, but it bears reiterating even if I have: VOY seems to be getting into a groove where it's very aware of both the years that it's been in production and the relatively short time that it has left, and is reflective of what's been done and what's left to do. There's been more than one line of dialogue recently that mentions that they've spent about six years in the DQ, although, technically, per the discussion last episode, they may not even be in the Delta Quadrant any more.) It also plays very heavily into Trek's theatrical tradition, which shows not only in the serious dramacred of many if not most of its actors, but also in how a lot of TOS seems to take place not only on a soundstage but on a regular stage, whether the scene is taking place in an officer's quarters with funky lighting and various 1960s-ish wall decorations or on a planet with funky lighting and rearranged styrofoam boulders. TOS had "The Conscience of the King", TNG had Data playing the title role of Henry V, DS9 tended to stay away from outright theater but did have an episode titled "Dramatis Personae" and some sharp commentary from Garak on Shakespeare. I don't have enough of a theatrical background (as in, any) to comment on how closely this setting maps to the classical Greek tradition, but it seems right. And, of course, the bits where crewmembers get shipped together and the Stunning Plot Twists of Seven really being the Borg queen, and Janeway knowing about it, were worth a giggle. Regardless, I still enjoyed the episode enough. They could have made much better use of John Schuck, who's got dramacred for days even for a Trek actor, but at least Kellie Waymire and Tony Amendola got a bit more to do. I'd also comment on the Cynics Corner's commentary on the episode, which is that not only is the Flyer pretty badly broken--and, contrary to what he says, not everything that they need is still functioning, not right away; a plot point is B'Elanna trying to get Kelis to get a needed part for her, which he does, but it's still not suitable for her purposes because of metallurgic impurities, which is pretty plausible--but also the whole thing about computer/interface security is moot because that ship sailed very long ago. Despite some thought given to it in the TNG tech manual, with LCARS stated as having some sort of fingerprint recognition or other form of biometrics incorporated into the touch interface (no idea what Data or the EMH do for that), both the Voyager LCARS and alien interfaces don't seem to ever require this. I always saw this episode as the series reacting to Star Trek fan fiction and having fun with the idea. I dunno how I missed that, because it completely explains the bit where he makes Seven of Nine the Borg Queen. That also explains something else I thought was funny but forgot to mention last night: the playwright's obsession with accuracy in the details. If he's a commentary on Voyager, it's weird because they really don't care about that stuff, (per my endless lament), but if he's a stand-in for fanfic people, they're poking fun at the thing I complain about the most about this show, which is so tone deaf that I gotta laugh. Another thought I had about this episode and narrative metacommentary: Less Good Fake Tuvok has a point when he complains about audience expectations. I wrote about it a long time ago, here, but the tl;dr is that selling an audience on an unexpected detail is always a risky move. This is why zarq's observation about the formulaic nature of TV is generally correct. I might have been amused by a little more back-and-forth in that argument. Despite some thought given to it in the TNG tech manual, with LCARS stated as having some sort of fingerprint recognition or other form of biometrics incorporated into the touch interface (no idea what Data or the EMH do for that), both the Voyager LCARS and alien interfaces don't seem to ever require this. Yeah. I even wrote about this way back in 2009.